« The Knockout: The New Soul Party Dance Show! The Jackalope once roamed the plains of the South and Southwest in vast herds that grazed on the natural grasses that grew there. Their antlers, originally used in ceremonial battles for territory and breeding rights, later proved a vital asset when battling buffalos for shrinking grasslands. 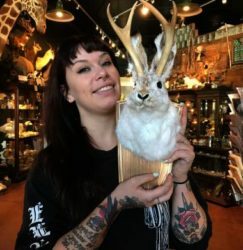 When forced into smaller and smaller regions the Jackalope became desperate for food, and would lay waste to entire farms, ranches, and the occasional saloon (Jackalopes are fervent heavy drinkers). Driven nearly to extinction by hunters and outraged farmers, these specimens are the result of an aggressive reintroduction plan.